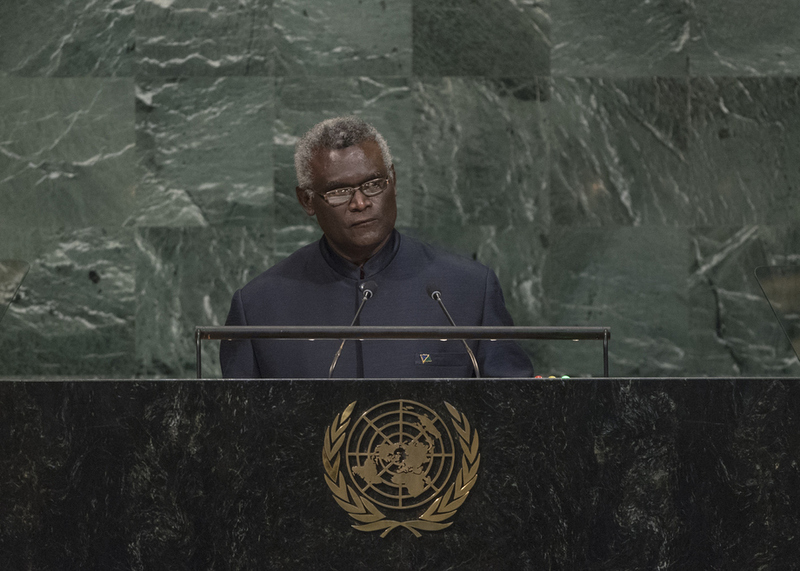 MANASSEH DAMUKANA SOGAVARE, Prime Minister of the Solomon Islands, noted that 2017 had been dominated by intentional provocations and natural disasters. Emphasizing the need to address the needs of the 65 million people around the world who had been forcibly displaced from their homes as a result of persecution, conflict, violence and human rights violations, he reaffirmed his Government’s support for the concept of the “responsibility to protect”. He urged the international community to stand firm in the fight to prevent crimes against humanity. “While [Pacific countries] played a minor role in the geopolitics of this world, we are now once again caught in the midst of a global power play,” he said, pointing out that those countries continued to deal with the remnants of foreign-imposed events, from world wars to nuclear testing. “Today, we refuse to remain silent,” he declared, condemning the actions of the Democratic People’s Republic of Korea in the strongest terms and calling on that country to abide by all relevant Security Council resolutions. The recent testing of ballistic missiles over the Pacific Ocean was an insult to the region’s people, he said, adding that “the sea is our sanctuary” as well as their source of food and income. Maintaining the health of the world’s oceans was not only in their self-interest, but in the interest of all people, he said, reaffirming the principles enshrined in the 1982 United Nations Convention on the Law of the Sea on the peaceful use of ocean spaces. Small island developing States such as the Solomon Islands faced the threat of climate change, the effects of which were occurring at an alarming rate on their shores and presenting a “clear and present danger”. Ocean acidification exceeded safe levels, he said, adding that his country had already lost six islands due to the effects of climate change. “We are in survival mode,” he said, stressing that while the horrors of a nuclear attack were undeniable, those caused by climate change were just as cruel. “If it’s not happening yet, it will shortly,” he said, warning that an unstable climate and the subsequent drivers of displacement and relocation could exacerbate some of the drivers of conflict, including migratory pressure, clashing cultures and competition for resources. Those challenges could in turn morph into threats to global peace and security, he said. He called upon major greenhouse-gas emitters to meet their nationally determined contributions, urging the United States, in particular, to reconsider its position on the Paris Agreement. Recalling that the Solomon Islands had recently made its first “humble contribution” of five police officers to the African Union-United Nations Hybrid Operation in Darfur (UNAMID), he thanked the international community for having come to his country’s aid through the Regional Assistance Mission to the Solomon Islands (RAMSI), noting that its mandate had ended on 30 June. He also thanked the Peacebuilding Commission for having facilitated the National Dialogue on Peace and Sustainable Development, which reflected an inclusive and clear consensus on the country’s priorities. He called for Taiwan’s inclusion in the work of the General Assembly, also voicing support for New Caledonia’s planned 2018 status referendum. It was to be hoped that the administering Power would show the same level of cooperation on the issue of French Polynesia, he said. The Solomon Islands condemned consistent human rights violations in West Papua, he said, adding that the people there had never been allowed to exercise their right to self-determination. Speaking in exercise of the right of reply, the representative of Indonesia responded to the Solomon Islands.